On Saturday I went on a hike at Paramount Ranch. 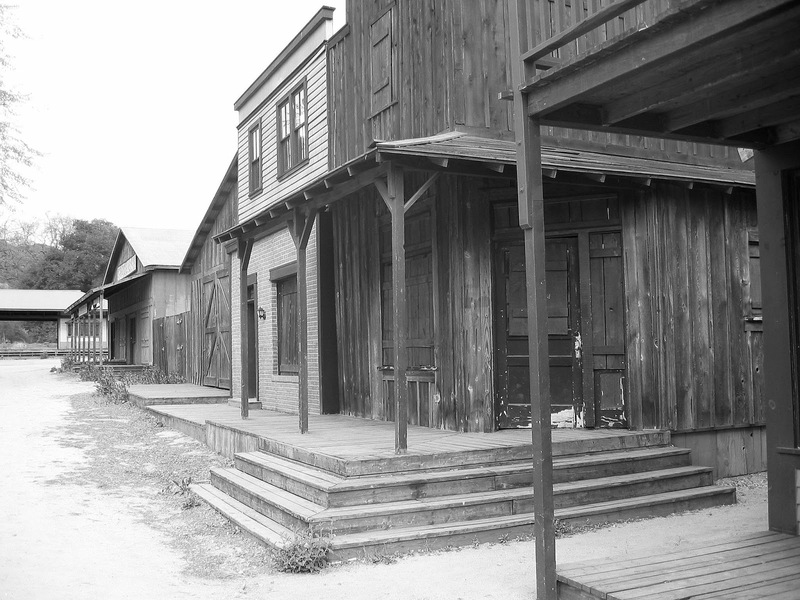 Paramount Ranch, location of a western movie set, is part of the Santa Monica Mountain National Park. 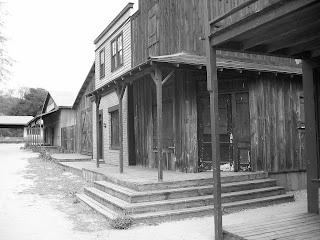 The hike started at the old west set. The buildings take you back to the 1800's - right down to the horse s*** in the middle of the street (Horses are permitted on the trails - watch your step). One of the buildings, a small wooden shack, was clad in bark in the front but the side was covered in fake, fiberglass, bark. It looked OK from a distance but not so great up close. I took some pictures before I headed up the Coyote Canyon trail. This place is a very popular place and there are a multitude of trails, spurs, and side-trails - with nary a smidgen of signage to be found. This caused me a lot on confusion. At the first branch, I thought it was too soon to be my turn-off so I continued straight on the trail. This turned out to be a minor error as I was now on the Overlook Trail. This trail ends in a chain link gate with yellow and red No Trespassing and Private Property signs secured with a heavy chain and padlock. This was kind of a bummer but turning around I was face to face with a beautiful view of the canyon. It turned out that this part of the trail was the most interesting based on the nature I saw. There were oak trees and flowering trees of white and purple. Some stretches of the trail were turning white from all the tiny white petals that were falling from the trees. I got back to the turn-off and got back on the Coyote Canyon trail. Soon after I was supposed to merge onto the Hacienda trail but I think I took an alternate route that paralleled the actual Hacienda Trail. This turned out to be fortuitous as the trail I was on went through a stand of oak trees and was quite delightfully. I stopped and sat down in the shade of the oaks resting my legs. I looked at my trail map which, by the way, was crap. I figured out where I was and started back on the trail. I got to the next branch in the trail and this time I made the right decision. I was now on the Backdrop trail. I came across another first for me - a snake. I have seen smaller snakes on trails before but those were less than a foot long. This one was over three feet long and was sunning itself on the path. He stuck his tongue out at me as I watched him. I made sure it wasn't a rattlesnake, took a picture and carefully walked around it. After I passed it, the snake slithered into the brush. Further down the trail I passed a mother and her two daughters riding horses on the trail - unlike the snake, they did not slither into a bush. We exchanged pleasantries and we parted ways, me being more careful where I stepped. From a high point on the trail I heard some vans and cars driving in the park. They pulled up to a grassy knoll and started setting up canopies and moving equipment around. It looks like they were setting up for a movie/television/commercial shoot of some kind. I couldn't identify who they were but I did notice one thing - while most of the people were in work clothes, there were two women dressed in identical bright yellow dresses. The women looked out of place. I presume they are the ones getting filmed/photographed. I thought about getting a closer look but I didn't want to intrude. Further along the trail I reached another decision point. There was a large stack of stones, known as a cairn, at the intersection of two trails. I decided to turn right. I think that was a bad decision because I expect I cut off 1/2 to 3/4 miles off the hike. The trail I took headed back towards the western set. I followed the path around until I recognized that I was about to go around in circles. I was right back to the place I had stopped and rested. I turned around, looked at the map a little closer, and made my way back to where I screwed up and headed in the other direction. This took me back to the trailhead. At the western set people were putting up signs and stuff. An American-Israeli benefit walk was going to take place later in the day. I was lucky I came early because I would not have been able to take pictures with all the people and signs around. Overall, this hike was about 3.86 miles by my GPS. It was supposed to be 4 miles so I do think I accidentally shortened the hike even with my canyon overlook detour. The confusion kind of detracted from my hiking experience. Next time I am going to see if I can find a better trail map. I do seem to complain a lot when I write about my hikes but I do enjoy hiking and I did enjoy this one as well. Pictures of the wild west set and the trail are here.